Wow! Activity in Tampa Bay’s industrial market increased significantly during the third quarter, with vacancy finally dipping below 9%! A major change in absorption was led by two, 1-million-square-foot Amazon.com build to suits in Hillsborough and Polk Counties. In addition to these two headline deals, the Tampa Bay region added another million square feet of absorption, providing the best showing for our market since the recession. Additionally, we are experiencing robust investor demand, originating from a diverse range of buyers in Florida, out of state, and internationally. In Polk County, construction was completed on a 1.1-million-square-foot distribution center at 1760 County Line Road that is 100% leased to Amazon. Also in Polk County, a new 175,000-square-foot speculative building is under construction at Interstate Commerce Park fronting I-4. As predicted, the increase in activity within Tampa Bay’s industrial market resulted in a higher closed transaction volume. 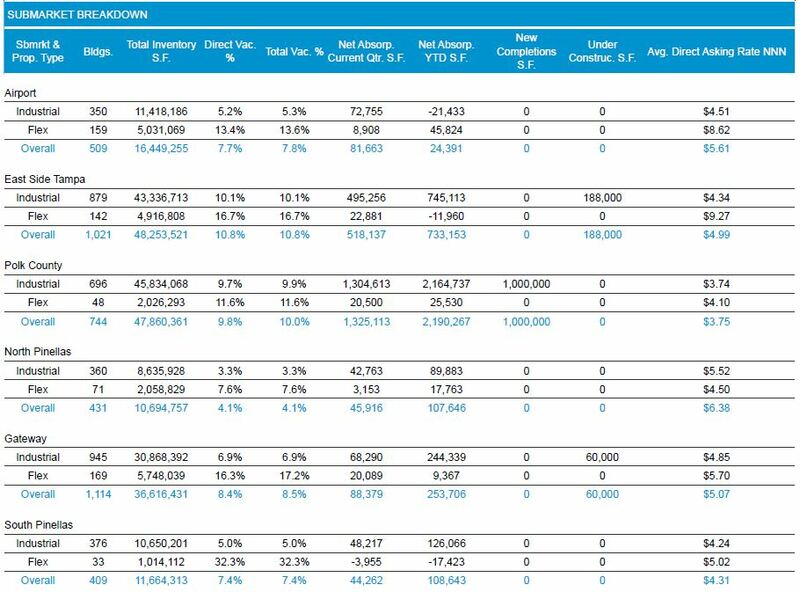 Overall, a net of more than 3.3 million square feet was absorbed (including Amazon deals) with the total vacancy dipping to 8.9%. The Polk County submarket experienced the most net absorption: 1.3 million square feet absorbed. In Pinellas County, the increase in overall industrial activity resulted in reduced inventory of available space; however this has not translated to an increase in rental rates and/or sale prices. The North Pinellas submarket continues to have the lowest total vacancy, 4.1%, and also commands the highest asking rental rate, $6.38 per square foot. Tampa Bay’s industrial market saw increased activity with construction, data centers, defense, aerospace and higher-end electronics tenants. There was also more interest from manufacturers than there has been in the past several years. Pinellas County increased activity in the 40,000- to 100,000-square-foot size buildings driven by technology demands for new equipment, more efficient production lines and improved layouts. 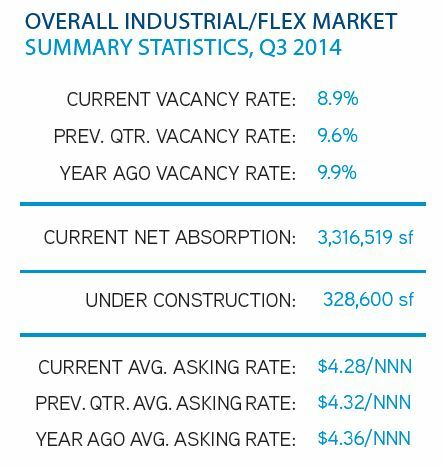 Tampa Bay’s industrial flex market remained relatively inactive, with the average asking rental rate increasing slightly, to $7.60. Overall, the Tampa Bay industrial market rental rates held steady from the second to third quarter. Concessions tightened with many landlords offering less free rent. In addition, tenant improvement allowances averaged to 50 cents per square foot. 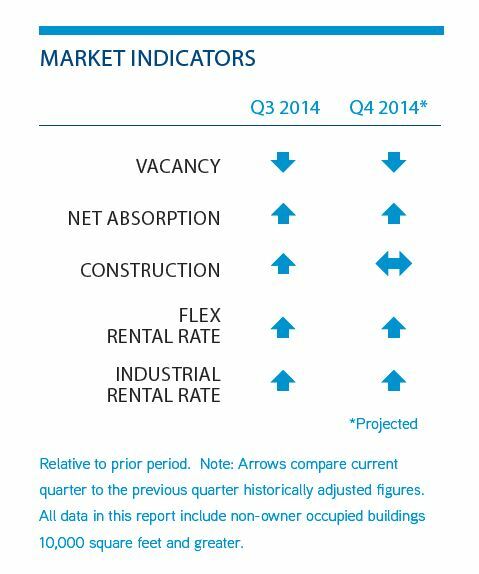 Investment demand for industrial space continues to be high; however, available quality product is in short supply. Many developers have land inventory for speculative industrial development. There were opportunities for small, local opportunistic investors for properties listed at $5 million or less. Our experts predict REITs and institutional investors looking to clear their books will result in new listings and closings of flex and industrial properties during 2015. EastGroup Properties has begun construction at Madison Distribution Center on a 59,000 and 68,000-square-foot-building with 30,000 square feet preleased. Cabot Crosstown, a 150,000 square-foot-building, is expected to be delivered in the fourth quarter. Construction continued on a new 80,600 square-foot warehouse at 1605 Turkey Creek in Plant City. In Pinellas County, Regent Properties has a 60,000-square-foot project on Belcher Road across from Interlaken that is now permitted. Regent is talking to prospective tenants and will break ground once a lease is signed. Aspyre Properties has begun construction of a 175,000-square-foot building within Interstate Commerce Park located on S. Frontage Road in Lakeland; delivery is expected in the first quarter of 2015.